I am definitely of the opinion that cooking should be easy – nothing too extravagant or time-consuming or confusing. As much as I admire the life and gumption of Julia Childs, any recipe whose instructions are spread out over a matter of days is not going to get a second glance from me! Let’s keep it simple and fresh and get it on the table before we all pass out from starvation and it’s been a good meal in my book. Once again, for THAT kind of recipe, I turn to the Post Punk Kitchen and Isa Chandra Moskowitz. I’m not going to lie, but Isa’s photographer took a much prettier picture of this dish, so if you want to see a more professional and lovely version of this dish, I highly recommend you hop over and check out food photographer Vanessa Rees’ work on this one. I can, however, attest to the fact that my dish tasted simply scrumptious, and I’d recommend it to everyone. My three-year-old heartthrob lunched with me this afternoon and declared it “so yummy,” and if that’s not a valid endorsement, then I don’t know what is. Prep all your ingredients before you start the cooking process, because that's the fastest part! It will be on the table in a matter of minutes. Preheat a large, heavy bottomed pan over medium-high heat. 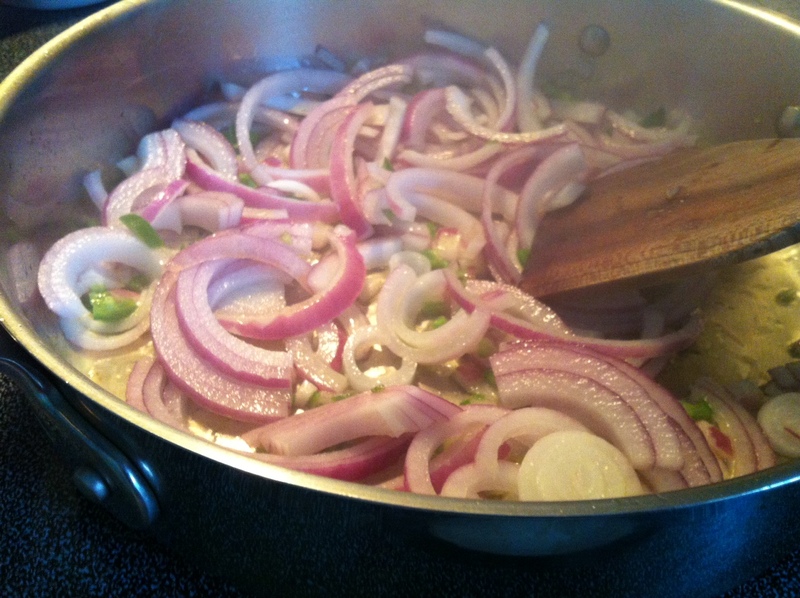 Saute onion and jalapeno in two teaspoons oil and a pinch of salt, until translucent, 3 to 5 minutes. Add the seitan and corn, and an additional tablespoon of oil and cook for about 5 minutes, until seitan is lightly browned, stirring often. 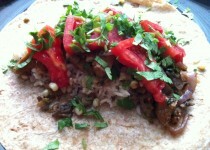 Add the mushrooms, cilantro, salt and pepper and cook for about 5 minutes. Push everything to one side of the pan so that you have space to quickly saute the garlic. Put the remaining teaspoon of olive oil in the pan and toss in the garlic, stirring as it sizzles, for about 15 seconds. Then mix everything together and add the lime as well. Taste for salt and seasonings, and serve over rice. Optional: roll it up in a tortilla with a nice scoop of guacamole. Garnish with fresh cilantro, if desired. 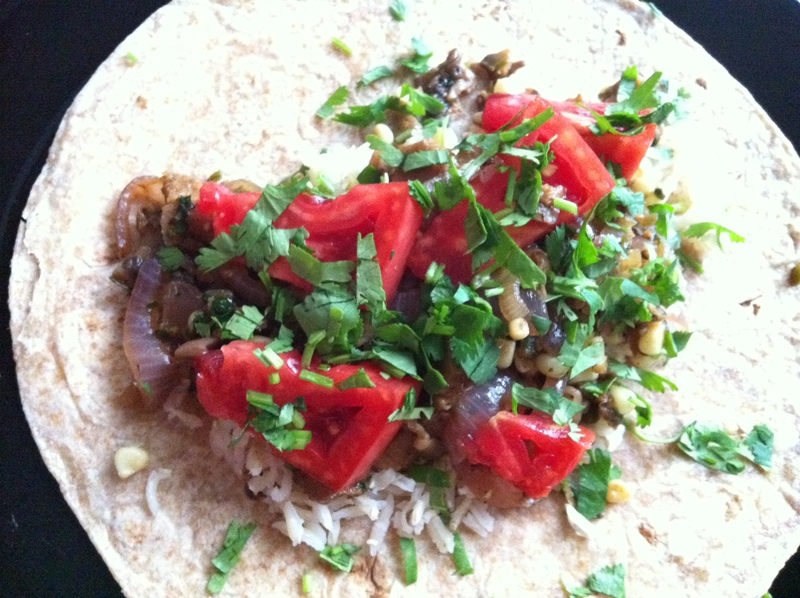 I will try this without the corn or cilantro. Picky me. My requirement for a recipe is that it has to be easier than grabbing a handful of almonds, or I’ll never start cooking. I can already smell this one. Yum……. If you can – the fresh corn makes all the difference. I wouldn’t have liked it with just any old canned or frozen corn. Cutting it fresh off the cob made it work. 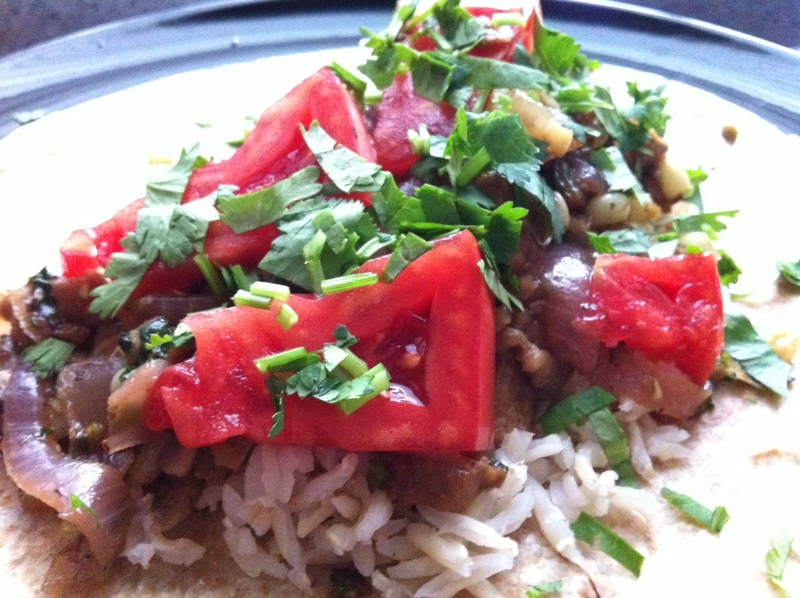 And the cilantro – no worries. I know how you are about that pesky green herb. I heart cilantro. This looks delicious, Arminda. I shared this website with my foodie friend Greg who writes a food blog. Yay! Thanks for sharing! What’s Greg’s blog address?